How do I add H1 tags to my Home Page? < h1 > tags can be an important part of your site's Search Engine Optimization (SEO) parameters since they are used by search engines to properly index and catalog your pages. 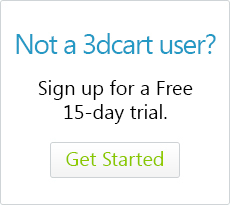 By default, 3dcart's templates are optimized to automatically include <h1> tags for your product, category and blog pages. However, you may also want to add them to other pages of your site. For example, your homepage can also benefit from the use of proper <h1> tags in its respective headers. 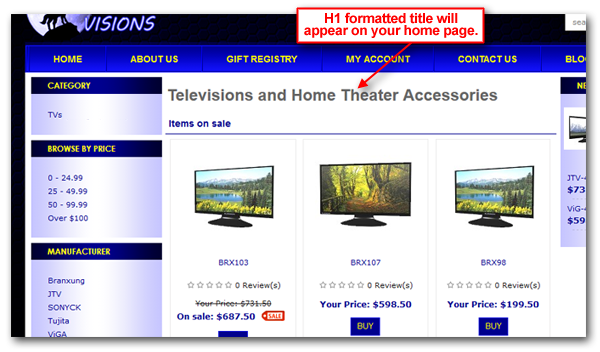 The best area in which to add an <h1> to your home page would be from the 3dcart Online Store Manager's Content ->Titles & Content area. Once there, look for the "Home" page and click its "Edit" button and you will see an area where you can control both a header and footer of the home page. Add your <h1> header information to the page. A quick, one-line summary of your products and/or services should suffice. Your store will then contain an H1 formatted title for its home page which will help towards your site's SEO. You may add <h1> tags to other pages of your site, but keep in mind that your store will automatically create these tags for your product, category and blog pages. The automatic H1 tagging for the Product, Category and Blog pages is a change that was made directly on on 3dcart templates in 2012. If your product, category and/or blog pages do not contain the proper H1 tagging, please be sure that your store is using templates served from the common folder.